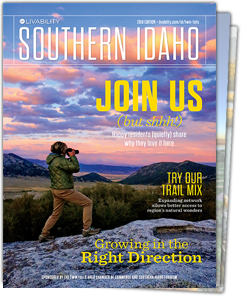 Southern Idaho’s high desert terrain is a playground for kayakers and SUP enthusiasts — just check out the thousands of people who hit the Snake River or take to the area’s reservoirs and high mountain lakes. Both lazy paddles and full-tilt thrills abound. All you have to do is choose your adventure! Shoshone Falls is a bigger than life paddle. Set in at Centennial Waterfront Park (no kayak or SUP? Rent one at the AWOL stand in the park). It’s a 4 hour round trip trek, with a portage around Pillar Falls. The journey offers an awesome view of the I.B. Perrine Bridge, BASE jumpers and Knievel’s jump site from below. At the end, you’ll float at the base of the 212′ Niagara of the West. It’s a downriver float back, but still, waters make the return trip feel the same. Offering great views of both the Snake River Canyon and the Perrine Bridge in the background, this park is great for both motorized and non-motorized water sports. When you need a break, have a bite underneath the park shelters — they come equipped with barbecue grills. Pillar Falls is a great, easy paddle. Set in at Centennial Waterfront Park (no kayak or SUP? Rent one at the AWOL stand in the park). Pillar Falls is about 1.5 miles upstream from Centennial Park, heading toward Shoshone Falls, and offers an awesome view of the I.B. Perrine Bridge from below. About a quarter mile past the bridge you’ll paddle around the final bend and see the enormous rock structures that make up Pillar Falls. There are plenty of places to dock on the north side of the area. Come summer, this stretch of the Snake is one of the most popular around — you’ll find tons of kayakers, SUPers, boaters, and other water sports lovers. Idaho Water Sports often sets up a riverside rental service next to the river in Heyburn in early summer; call ahead (208-678-5869) to see if rentals will be available. 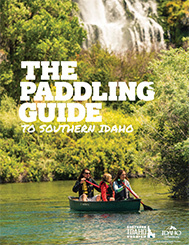 Southern Idaho Tourism blogger Steve Stuebner is a fan of SUP in the Snake River around Hagerman, where you can do loops around Ritter Island or paddle Billingsley Creek, both at Thousand Springs State Park. Read his recommendations here. This beloved swimming hole in the Snake River Canyon near Twin Falls is incredibly popular during the summer — it’s equipped with picnic areas, playground equipment, a sand volleyball court, and places to scale the canyon’s walls or cast a line. But for the full Dierkes Lake experience, take your SUP out on its placid waters and wave to the landlubbers ashore. Kayakers and SUP enthusiasts love this lake near Rupert. The park is located at the northwest end of the Bureau of Reclamation’s Lake Walcott Project, a welcome refuge on the edge of Idaho’s high desert. Make a whole day of it here: There’s a canopied park, campsites along the water’s edge, and a disc golf course. Nestled in the Albion Mountains of the Sawtooth National Forest, 8,300 feet above sea level, is one of the reasons Idaho is nicknamed the Gem State: Lake Cleveland. Just 15 miles south of Albion, the drive to Lake Cleveland includes an astonishing 3,600 feet elevation change. The elevation makes for breathtaking views but also makes Lake Cleveland only accessible from July to October because the colder temperatures and snow drifts. Once the roads are clear enough for drivers the Lake Cleveland campground is spotted with tents, RVs, kayaks and fishing poles. SUP enthusiasts will love this calm mountain lake. Blue Heart Springs is one of the most spectacular sights in Southern Idaho, a captivating pool of gorgeous blue water. This ancient cove is located off the Snake River and, at 58 degrees, is a tad too cold for swimming — but perfect for SUPers and kayakers who want to take in the crystal blue waters. For expert kayakers, the Class 5 Milner Mile below Milner Dam is one of the most heart-stopping stretches of the Snake. The thrills continue with a 25-foot drop off the left side of Caldron Linn or Star Falls, another expert-only run. Southern Idaho’s high-desert landscape is made magic by water – the mighty Snake River, massive waterfalls, and gurgling freshwater springs and placid lakes. During the summer, the best way to see this area is over the bow of a canoe, from the seat of a kayak, or atop a stand-up paddleboard. We’ve rounded up the top places to explore — and cool off on the water — this summer.